Every new move comes with struggles and challenges, which makes self-care and self-maintenance that much more meaningful. But when you are in a new city, where do you go and who do you trust with that all-important hair cut? Whether you live for product or just want to wash and go, finding the right person to get you lined up is just as important as the style itself. I finally found the one, in the process of wandering as a Sea the City Explorer. Scenes like this are not hard to come by at Scotch Pine. Scotch Pine sits in the corner of Chop House Row, with its full-view windows, eclectically-selected music, and open, welcoming doors. The broom that keeps the floor clear is masterfully constructed as an intricate pair of scissors, and the space is fresh and inviting. Tone Loc’s “Wild Thing” plays as owner and team are working on individual patrons. They converse with ease as clippers and scissors come in and out of sight, in this true-to-form barbershop. 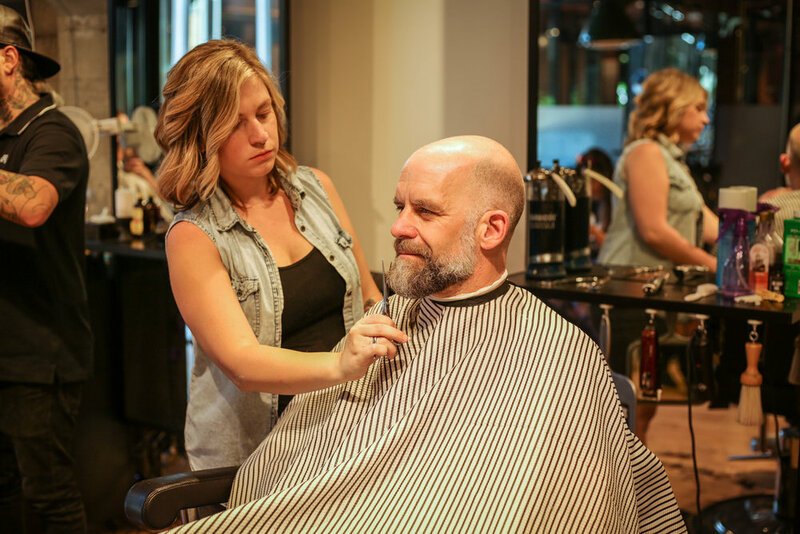 Whether you’re coming in for a maintenance trim, full groom or haircut, they service and welcome all. Our arrival finds the hair-expert entrepreneurs themselves in the first chair. Emily Rawlings, owner proprietor of Scotch Pine, was just finishing husband Josh’s, the math and money man, crafted look for an upcoming wedding- his mustachioed countenance reminiscent of an old boxing scene of long ago. Every chair is full and a few patrons are early for the next exchange. Scotch Pine owner Emily Rawlings with husband Josh Rawlings. The true story of Emily and Josh starts in music (jazz to be precise) and Josh’s passionate calling. Paths do cross and it doesn’t always mean sparks, but this couple’s working relationship turned into something more over time. The singer and her piano man now have three kids in the mix, and Pancho, a grateful dog rescued from under a far away bus. All extra voices in their band. It’s warm for a Seattle day, and the joy of sunshine has put smiles on every passerby’s face. People look in, ask questions, and Emily is there with a ready answer, and two provisos to any appointment inquiry. One: they have a specialist who does women’s hair, and two: no dye. In conversation, Emily references Scotch Pine as a barbershop and as a community. They gear themselves toward that vibe and want it to be maintained with every single patron. It was what started the history of the business and what keeps people coming back. Originally, they were located in Lower Queen Anne, in a space that was a barbershop from 1927 forward. Rent prices, developer pushes and the ever-present climb skyward made it untenable to maintain there, which is when this space on Capitol Hill became their new home. Emily Rawlings, Owner of Scotch Pine. Her eyes have a spark as she talks about this place, a passion that reminds me of how chefs speak of ingredients. This team of professionals is conscientious, as they know the role they play. The barbers are leaning in, looking back and circling clients ensuring every person walks away perfect. All ingredients to this place and process matter. Emily mentions more details of the barbershop’s vision: the products they are creating (pomade for example) and what the leftover clips of hair could do. It is something that, due to Seattle’s laws, cannot be composted. And yet, Emily maintains, there has to be a way- something better than the trash. With a keen eye and a mindful presence, I pop from place to place and interrupt as I have questions. I ask about her staff: the chairs are hosting seasoned professionals, none new to the craft. Emily mentions, “People come, go, and then they come back.” Speaking of members of the team that have left and returned. Lindsay (Left), one of the seasoned professionals that you'll find at Scotch Pine. She talks of the barbers because there is something like home in these 4 walls. She has now moved from styling to styled, settling in Lindsay’s chair. There is friendship and trust, the kind that lets me know she could easily have settled into anyone’s chair in the place. This is why the barbers return: trust always fosters respect, and this team has that for each other. As pictures are taken and conversations are had, I find myself watching from the courtyard as if the space were a show of its own. This is why, rather than only asking a barrage of questions, I stepped into their moment, joyful, alive, laughing- a dance or two to be had to a song played, a constant invitation to join in. Just being in the space, feeling the energy and laughter, was soothing. Not a single person who left the shop looked ill-at-ease. They were all happily on to their next moment, lighter not just in hairs trimmed but in spirits lifted. The ability to hold a conversation, really listen, commiserate when needed but to connect with people: these are skills further and further removed from what we find in the everyday. But this is what the barbershop was in communities of the past and this is what Scotch Pine is maintaining in their space today. 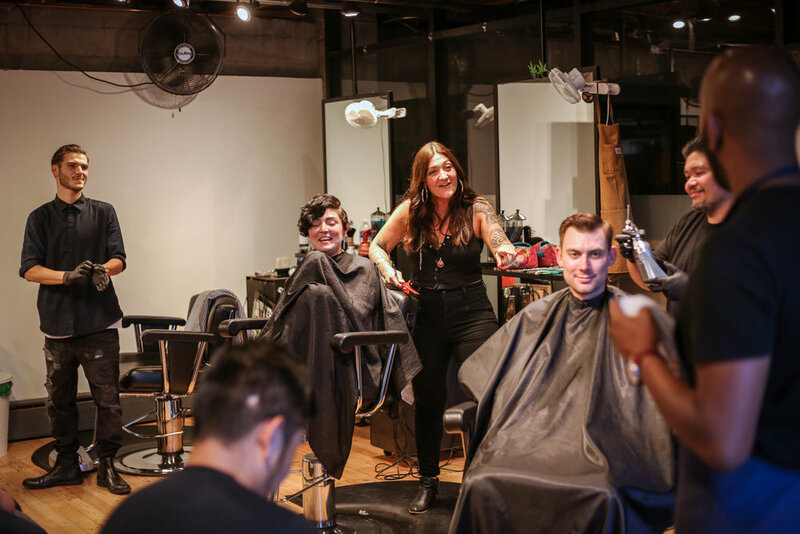 Cultivating a community one patron, and one snip, at a time.